Douglas Alan Groves has been working with and studying elephants since 1972. Before coming to Africa in 1987 to work on a film project involving elephants, he had worked with elephants in zoological and wildlife parks on the west coast of the USA for 15 years. 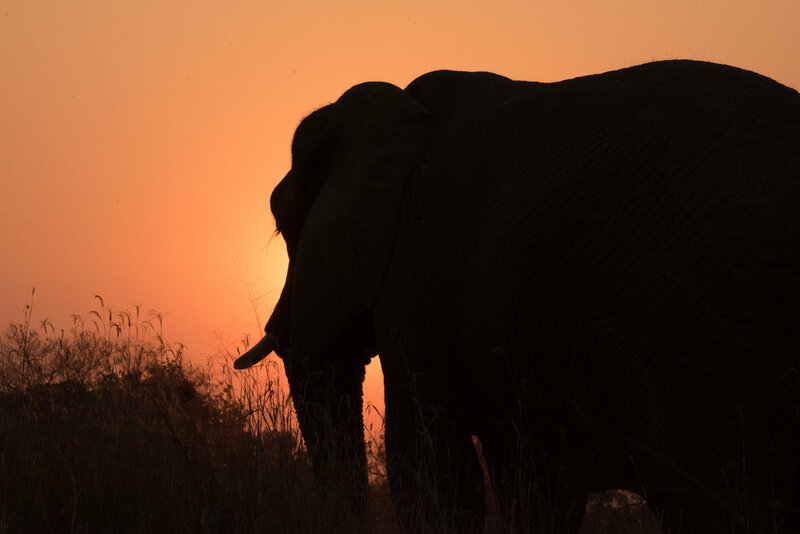 Once in Africa his attachment to and passion for elephants only deepened and he decided to commit the rest of his life to studying them and their needs and to teaching others about them. Doug has since been involved in numerous research, educational, film and eco-tourism projects involving African Elephants. He is also full-time caregiver for three orphaned African elephants whom he adopted shortly after arriving in Africa. The moments in life he finds the most fulfilling are when, with an elephant trunk gently resting in his hand, he walks the elephants single file into the bush to find their food for the day, while he shares with visitors walking beside him his knowledge of the elephants' habits and needs and the dangers facing them. Sandi Groves studied Zoology and Botany at the University of Natal, South Africa. In 1990 while working at Karkloof Falls Nature Reserve in South Africa Sandi met Doug and his adopted elephants. Both won her heart and she joined Doug in his commitment to the daily care and upbringing of the elephants in the wilds of Africa as well as in inspiring others to love and protect elephants. Sandi concerns her-self greatly with the emotional, physical, intellectual and nutritional well-being of their elephants. Her ultimate satisfaction at the end of a day, in the bush, is when the elephants meander contentedly home with bellies full to the brim. Sandi has a passion for all animals and especially elephants. It is her goal to create better understanding between people and elephants by sharing her knowledge and intimate connection with them that spans close on 30 years. The bull and baby of the herd, Jabu and Thembi respectively, were orphaned in Kruger National Park (South Africa) culling operation. Doug and Sandi adopted them as emotionally traumatized and insecure two-year-old calves in October of 1988. Since then, Doug and Sandi dedicated themselves to the health, quality of life and personal development of these elephants who grew into delightfully well-adjusted adults, with a proud and accomplished history as wildlife ambassadors. Tragically Thembi passed away very unexpectedly in March of 2017 after the very sudden unset of colic. Jabu is a 31 year old bull, impressive in size and personality. He is over 3.5 m tall, and 5.5 tons. He has the kindest eyes, and the most gentle heart. Jabu has been the focus of our Foundation's efforts as he battles a wrist injury and osteo-arthritis after an encounter with a wild bull in 2016. Jabu and the Groves are Dodo Heroes in an upcoming TV episode called "Dodo Heroes" on Animal Planet worldwide on June 9th at 9pm. Morula was orphaned by a Zimbabwean culling program. She and a bull named Zorba were then sold as pets to a Zimbabwean family. But when the bull killed a man, the duo were sold to Borokoalo, a park in the northwest province of South Africa. There, Zorba proceeded to kill seven white rhino and flip over a vehicle. The park authorities decided that there was no alternative but to have Zorba destroyed. Morula was not implicated in the rhinocide, but she was an elephant alone who had not had the happiest of lives and did exhibit some anti-social behaviour and so she was offered for adoption to Doug and Sandi.